Originally posted: November 28, 2016 . Last modified: April 18, 2019 . These chocolate chip cookies are the best chewy chocolate chip cookies you’ll ever eat. They are chewy, sweet, and stay soft for days. Thanksgiving is over, and we’re moving full speed into December. That means only a few short weeks until Christmas. December is one of the best months in my opinion. For the last several years, I’ve baked tons of goodies for the entire month. There’s nothing like traditional baked goods and candies to get you into the holiday spirit. Some of our favorites are Christmas Rocky Road Fudge, English Toffee, and Chocolate Covered Pretzels. 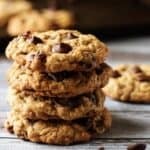 Several months ago, I came across many cookie recipes that used cornstarch to keep the cookies soft. I was skeptical, but what did I have to lose? After playing around with the ingredients, I finally found something that seemed different from other recipes. To my surprise, cornstarch worked extremely well and kept the cookies soft for several days. Give these a try and see what you think? Preheat the oven to 350 degrees and line a baking sheet with a silicone mat or parchment paper. Measure all the ingredients and have them ready and available to use. Place both sugars and the butter into the bowl of a stand mixer. Use the paddle attachment and mix on medium speed until the sugars and butter are fluffy. This process takes about three minutes. Add the egg and vanilla, and mix on low speed until combined. In a separate, small bowl, combine the flour, baking soda, cornstarch, and salt. Add the flour mixture to the wet ingredients, and mix on low speed until well combined. Stir in the chocolate chips by hand, so they aren’t broken apart by the mixer. Scoop the dough into small amounts and roll into balls about 1 1/2 inches in diameter. Place the dough balls onto the baking sheet about 2 inches apart, and put the pan into the refrigerator for at least 30 minutes. Allow the dough to chill so it doesn’t spread as much when it bakes. After the dough chills, place the baking sheet in the oven and bake for 10-12 minutes. The cookies bake in exactly 11 minutes each time. The cookies are finished when they are lightly browned but still soft in the center. The edges will not appear crunchy or crispy. Remove the pan from the oven, and allow the cookies to cool for 2-3 minutes before transferring them to a cooling rack. The cookies will set completely as they cool. Serve after they cool or store in an airtight container for up to 7 days. Need another decadent dessert? Then checkout our Brownie Mix Turtle Brownies! 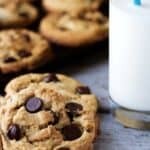 If you like this chewy chocolate chip cookie recipe recipe, please leave us a comment and rate the recipe card. You can also find us on Facebook, Pinterest, Twitter and Instagram searching for Berly’s Kitchen! These chocolate chip cookies are the best chewy chocolate chip cookies you'll ever eat. They are chewy, sweet, and stay soft for days. In the bowl of a stand mixer, use the paddle attachment to cream together the sugars and butter on medium speed until fluffy (about 3-4 minutes). Add the egg and vanilla and mix on low speed until combined. In a separate bowl combine the flour, cornstarch, baking soda, and salt. Carefully add the flour mixture to the wet ingredients and mix on low speed until combined. Shape the dough into balls about 1 1/2 inches in diameter. Place the dough balls on the baking sheet and place in the refrigerator for at least 30 minutes prior to baking. After the dough chills, place in the oven and bake for 10-12 minutes. Remove the cookies from the oven when the cookies are lightly brown but still look soft in the middle. Allow the cookies to cool for 2-3 minutes on the baking sheet then transfer to a cooking rack. *Calories are calculated for a serving size of 2 cookies. Yummy! You’re right Kimbrely; there’s nothing like baking cookies to get you into the holidays spirit! :) We feel the same way and bake tons of kourabiedes and melomakarona every December:) Your cookies look fantastic, we’d LOVE to give them a try. Excellent work! Mirella and Panos, I hear Athens is beautiful! 🙂 Thanks for stopping by, and enjoy the holidays. Happy baking! This is a always winning dessert! and also fun to do with the kiddos! Thanks for sharing! I agree on all accounts. My wife makes some really good cookies and sharing that knowledge with our son has inspired a desire to cook within him as well. Thank you for your comment! I loooove a good chocolate chip cookie! Yours looks so chewy! Your beautiful photos got me in the mood to bake some! I never knew that about cornstarch. Thanks for sharing. Me too! I think the corn starch was her “secret” ingredient lol! Thank you for your comment. Thanks, Gloria & Emanuele! Hope you have a great week, too. Yum!! I love soft cookies 🙂 This looks like the perfect way to start cookie baking for the holidays! Thanks for the recipe! Thank you, Michelle! We love soft cookies as well. The best part about baking them at home is that you know all the ingredients that went into making them soft and chewy. Chewy cookies are the best. Who doesn’t chocolate chip cookies. The true classic is always a hit. I agree with you 100%, Gloria! Chewy cookies are the best. Oh wow! These look incredible! I will definitely need to try the cornstarch. Perfect for holiday baking. Thanks, Tara! Cornstarch definitely keeps these cookies chewy. Nothing can beat a great chocolate chip cookie! I will have to try the cornstarch out! I’ve never heard of adding corn starch to the cookies to keep them soft. Can’t wait to try these! I love soft chewy cookies although I have to say, whenever I make cookies they rarely last long enough to dry out anyway! These look fantastic! I use cornstarch in some cookie recipes too and love it! It really does keep them nice and soft & chewy! I’m so glad I found cornstarch. It really works. 🙂 Thanks, Amy! Chocolate Chip cookies are the BEST, especially when soft and chewy! Love the secret ingredient! I agree, soft chocolate chip cookies are the best! Thank you for your comment.